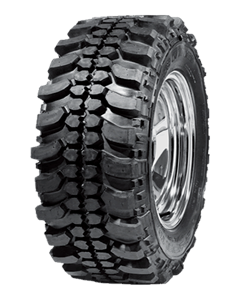 The Insa Turbo Special Track tire is designed for the high Off-Road competition. It has a great push power, an excellent traction on any area, and great resistance to the external impact and to the weather inclemency, being the perfect tire for the 4x4 and the extreme adventure lovers. The most advanced R&D has allowed to Insa Turbo to make the Special Track, being a bet for the quality, the innovation and especially the ecology. In addition its aggressive profile combines the most advanced technology with avant-garde aesthetics, according to the needs of the most demandingly 4x4 driver. It was made with an ultra-resistant and lasting rubber compound which provides it less rolling resistance that reduces fuel consumption and the CO2 emissions, reducing noise in motion, and helping to grip and safety sensation due to the ideal performances balance. Its width and deep tread on the shoulders provides to it less wear and an excellent traction. Central space of the treadreduction to improvehandling and mileage power. Its wide cavities on the shoulders optimize the traction in mud and snow to improve its safety. Off-roads variable disposition which provides more silent driving. Less off-road in the tread to increase its handling and to improve its capacity of braking.